Both references are identical. SE 8.5 km from Bistrita is Budus (It is part of the Lower Budacul) and to the aerodrome are exactly 8.5 km. The grass surface measuring approx. 2560 x 760 meters is actually the size of the old Budak airfield. I support and have evidence. In the 40s, the Hungarian aviation used as emerging landing (the foundations of the two hangars were still visible) and used East to West landing. Between 26 August and 11 October 1944, the Luftwaffe aviation used the SE side of the airfield, the entire clearing of the forest for the camouflage and the repairs of the airplanes. 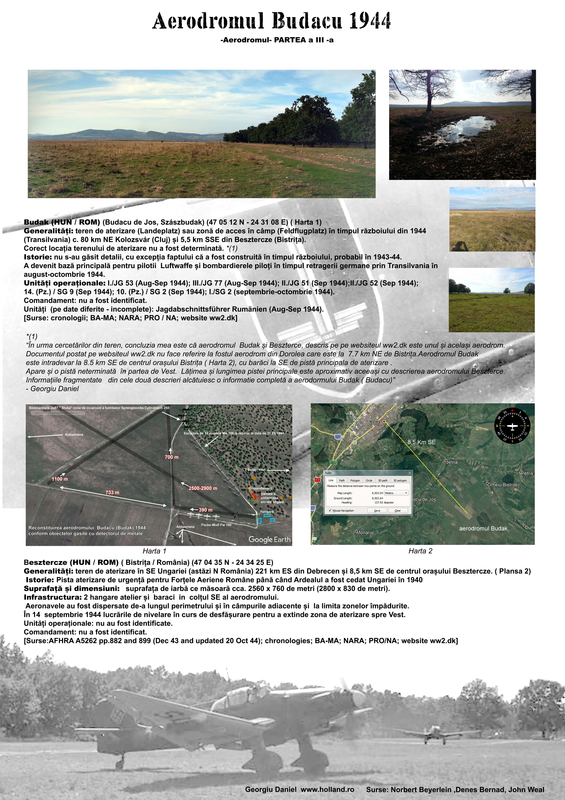 About Luftwaffe Budak airfield 26.8.1944 - 11.10.1944 ( Hungary now Romania). Gross Betschkerek, or Hungarian: Nagybecskerek, or Ecka airbase, Zrenjanin, Banat, Vojvodina, Yugoslavia. A friend of mine who developed a particular interest in this airbase bought two photos showing some Ju 52 wrecks with code 4V+.. Apparently taken by a Red Army cameraman when they entered the area, which would be in autumn 1944. These are attached. Could someone please review and possibly confirm that these photos were indeed taken there, and which unit the Ju 52s with the said code belonged. Source: Photos are in private collection, I understand. a. My friend thinks, or rather feels, that the photo may have been taken at Nagybecskerek (I presume in autumn 1944). b. Dénes Bernád confirmed on FB page entitled Luftwaffe Fliegerhorste 1933-1945 that he had seen the above photos before, albeit labelled as being taken in Romania. c. You suggested that these photos may even have at the Korsun (Cherkassy) pocket in February 1944.
d. The participants generally agree that the Ju 52s belonged to (III./)TG 3. The friend of mine will send me the name of the Soviet photographer, for ready reference. In short, it is undecided, but some progress has been made. The Red Army photographer was Yevgeny Ananevich Khadel. Liberation of southeast Europe, WW2, Eastern Front. Now that you we know the photographer's name, things could become easier. Yevgeny Anan'evich Khaldei (Евгений Ананьевич Халдей) was the most famous Soviet photographer during the war - https://en.wikipedia.org/wiki/Yevgeny_Khaldei His photos are in official Soviet collections inherited by modern Russia, so it should be possible to contact the holders of these collections and ask for details of the location where the image was taken. That may be difficult without local knowledge, of course.